When did you order (date you paid): I paid an initial 10% deposit in March/April and the final payment was paid on completion. Good communication? 3 Excellent communication throughout! Prompt shipping? 3 Oh my goodness- it was soquick, next day delivery!! From Estonia to the UK! Production time, if relevant: 3 Olga began working on themalmost straight away although she had initially advised it would have to wait for a couple of months until she completed her previous commissions. It took about 4 months in total. I was expecting it to be much longer. Item as pictured and described? 3 Yes, in fact it is difficult to show in photographs how detailedand tiny they actually are! So they are even lovelier than these can show. Quality of porcelain (too thin? Rough spots? ): 3 The quality of the porcelain is excellent, perfectly smooth, not a seam line in sight, and a nice weight. Quality of paintwork: 3 The paintwork is excellent! Again, it is very difficult to capture with my camera- I need a macro lens!! Quality of sculpting: 3 The sculpt is so finely done, it's hard to believe so much detail can be done on such a small scale! Quality of accessories (box, stand, wig, clothing, etc): 3 The standard of accessories is of the highest quality. The wigs and clothing are beautifully made, the boxes are gorgeous, and the quilted velvet protective wraps are beautifully made too. All is produced to a very high professional standard. Other comments? Words cannot describe how pleased I am with this purchase. Olga was an absolute pleasure to deal with, and her standard of workmanship is of the highest degree. No detail is too small and they are just incredible! Would you order from this company again? YES!! I am already plotting and scheming for a way to purchase another one! What did you order? 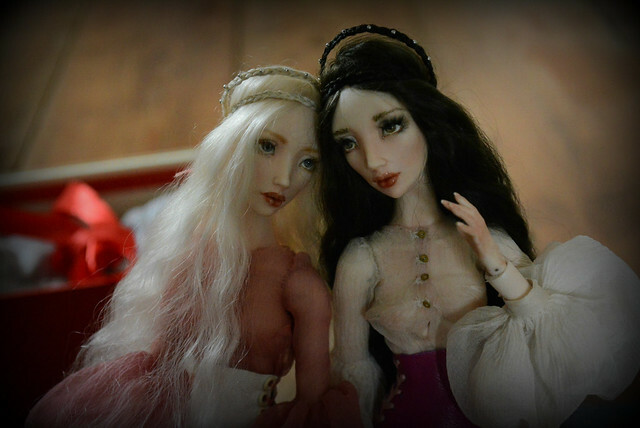 Custom doll Alinta because I fell in love with her sister Agnia. Link to the website or thread you used to make the purchase, if any: Saw her on Flickr, paid by Swift. Clear photos? 3 - Firstly amazing photography of Agnia, then progress photos and videos of Alinta. Really beautiful quality of the detail. Easy to pay? 3 - Via Swift, which used to be hard for me but now I can do this online via my bank. Good communication? 3 - always immediate and friendly. Prompt shipping? 3 - yes, we worked a suitable plan together. Production time, if relevant: 3 - was as planned with Christmas break in between. Quality of packaging: 3 - Beautiful, strong professional box with a quilted velvet wrap as the liner. Did the quality match the price? 3 - definitely, her work is far superior than the price she charges! Item as pictured and described? 3 - although this was custom, there was good quality progress photos and Olga followed my brief fantastically. Quality of porcelain (too thin? Rough spots? ): 2.5 - excellent all over balance to the thickness, such a tiny doll means she feels fragile but is very strong. Amazing attention to her face and upper torso but less attention to her leg seams. Has a pleasant grained texture. Quality of tension (does the doll hold poses? Too loose and floppy? ): 3 - steel springs which hold amazingly. Very firm, creaks a bit but I guess that is normal. Quality of paintwork: 3 - spectacular, detailed and realistic paintwork on all areas of her body. Her eyes and face are extraordinary. Quality of sculpting: 3 - Should be a 5! The detail of such a tiny sculpt is extraordinary. Her body is beautifully detailed, hands and feet so well proportioned, her upper torso is jointed but incredibly well engineered, her face .. so human! Quality of accessories (box, stand, wig, clothing, etc): 3 - Really well accessorized. Fully clothed in Olga's unique delicate style and with a stand. Her wig is fixed which I didnt realise but is so perfect for her face I wouldnt want to change it. Other comments? Considering the amazing detail of the sculpting, these dolls are soooo small with many carefully engineered parts, no doubt sueding is very difficult. It is a bit is uneven in a few places, where porcelain is on porcelain, a bit of glue showing and peeled back a bit in the knees and ankles. It makes me nervous to move her too much. I am sure Olga would happily fix this but I dont want to let Alinta leave me ever! As I have several other 'play dolls' Alinta is a most spectacular artwork sculpture in the collection case which is perfectly fine. Would you order from this company again? Absolutely. Olga's sculpting skills, life-like paintwork and mechanical design is amazing value and a must for collectors.